Accounts are the individual utility accounts that you would like to track billing data for. Meters are the devices that measure your consumption at your Facility. Each Account can have one or multiple meters depending on how they are set up. Typically, you can find your Account number and Meter number on your actual utility bill. 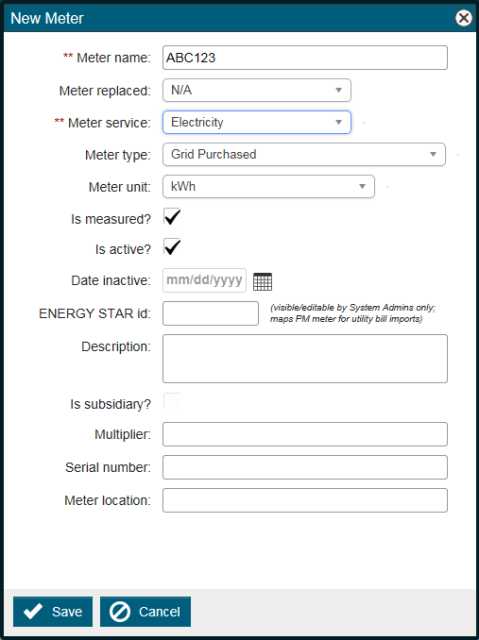 Click on Utility Accounts, and then click on Accounts & Meters. Select a Facility from the drop-down list. Select the corresponding Vendor from the drop-down list. Enter the Account Number as it is displayed on your utility bill. Next you will select a Start Date. This will default to the start date of the database. You do not need to change it unless needed. Now that you have saved the Account, the Meters tab at the top of the Account screen will be available. Click on the Meters tab. Select the Meter Service from the drop-down list. Check whether or not this meter Is Measured?